Hark! It’s Christmas Program Season! 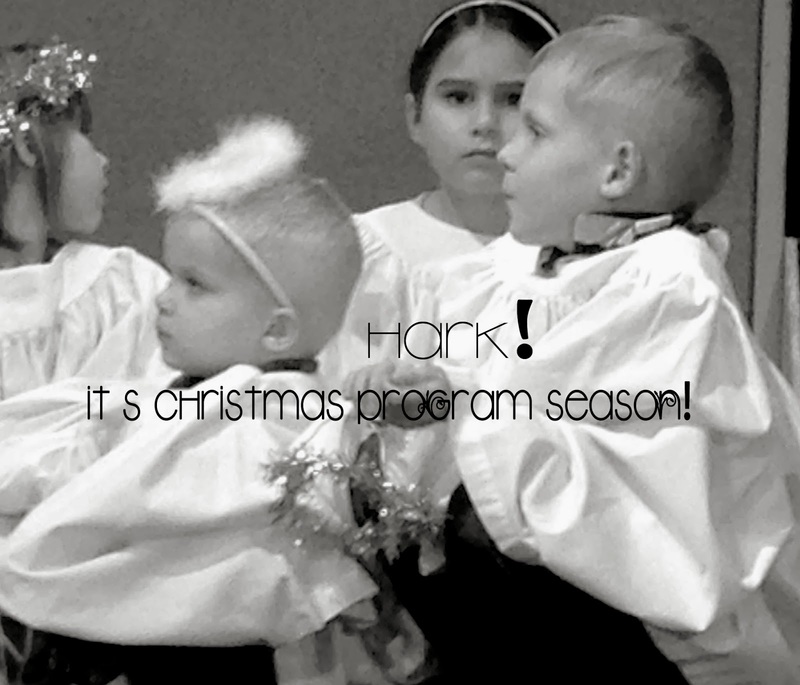 We are up to our halos in Christmas Programs around here. Tonight all the kids are in the church’s Christmas program. Tomorrow night, they’ll all in the school Christmas program. You know what Christmas program practices are like? They are that hour before we have company come over to our house. They are stressful chaos. They are one highly anxious mama trying to whip her kids into shape. All of the sudden I see our filthy, disorganized house for what it is. Scratched base boards! Gunk on the trash can lid! Cobwebs all over the kitchen chandelier. What will our guests think of us?! The panic of that question turns my vision red. My husband and kids, who didn’t know having another family over for dinner would necessitate them scrubbing dog slobber off the back of the couch, look at me with fear in their eyes. The company will be here in ten minutes, and I’m trying to remove rust stains from the toilet. And I’m calling to my husband to clear the bird’s nest out of the front door wreath. And he’s pretending not to hear me. This is a disaster, I think. How did I ever imagine it would be a good idea to invite anyone into our house ever? All of this? Yes. This is Christmas Program Practice. This morning the kids had dress rehearsal for the Christmas program, and the scene at school was high-pitched stress. With three hundred guests coming over to watch the Christmas program, the pressure is high. The teachers want the kids to do their best, but they also want to show the best of the school. They’re polishing the proverbial couches and scrubbing everything up for company. As the stress level slowly crept higher and higher, all the kids were getting the same look my family gets when I start with the, “Cleanyourrooms!Don’tjuststufftheclothesunderyourbed!Andmakeyourbed!” You know the one, that glassy, detached look kids get when they sense the grown-ups are losing it over nothing. It’s not nothing, of course. Kids need to stand still on stage just as much as they need to learn to clean their rooms. Dusting off your best manners and your fancy plates is an important exercise. Not to mention, these kids will be sharing the message of Jesus’s birth with hundreds of people, some who will not hear it any place else. I can almost forecast what will happen tomorrow evening at the Christmas program. The kids will do beautifully. Their loud singing, focused faces , and unending enthusiasm for the Christmas story will bring tears to even the almost skeptical eye. Those stressed out teachers will watch with wonder as the kids pull out a perfect performance. I see our friends, full and satisfied from a shared meal and so content in our home. Happy Christmas Program Season to all of you. May the kids sing loudly, the teachers be relaxed, and the message be shared. And next year, may we remember how beautiful it will all end.